I started watching Riverdale yesterday, and got about halfway through before I had to hit the hay, but I fell in love instantly. It’s dark and grungy and fun and I can not get over how strongly I feel about it. It has a beautiful guilty pleasure vibe that I get from Jennifer’s Body, but with better everything. When Jason Blossom is assumed dead (and later found with a hole in his head) and new girl Veronica shows up, things in Riverdale are thrown for a loop. We watch mental break downs, family drama, and everything wonderful that could walk out of a wardrobe trailer. 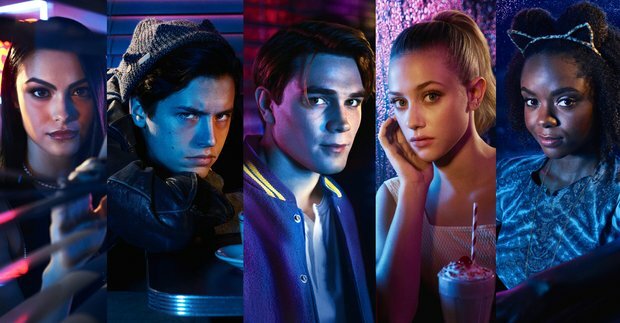 From left to right; Veronica (Camilla Mendes), Jughead (Cole Sprouse), Archie (KJ Apa), Betty (Lili Reinhart), and Josie (Ashleigh Murray). A big part of my infatuation has to do with the aesthetic. There’s a blue filter over everything, the clothing is perfect, and the teen angst is just so strong. I can not get over how into this show I am. There are twists and turns everywhere in Riverdale, and I honestly think you should watch it. It has characters from the main group, plus a rad take on Josie and the Pussycats. I’m done writing, I’m going to go finish watching this series.